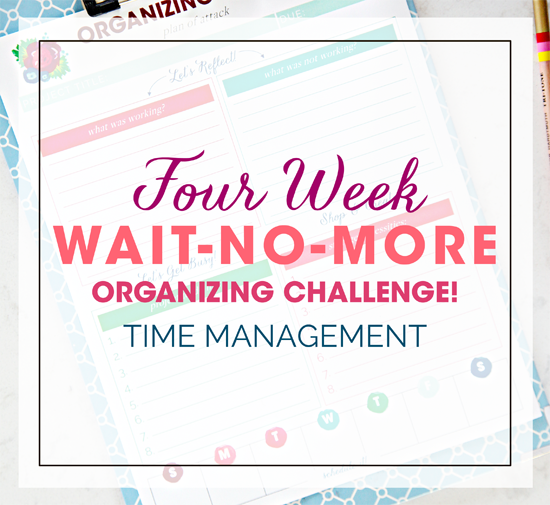 Welcome to the first week of our Four Week "Wait-No-More" Organizing Challenge! I wish I had some astonishing before and after photos for you, however, I decided that this first week I needed to focus on the area where we needed the most help... time management. However, I have a feeling a few of you will be able to fill the before and after void. I don't know what it is. I can tackle a closet and organize it down to the last shoestring, but time management? It is a whole different ball game. And with the number of ball games we attend each week... Managing time effectively is really crucial to daily success, far more so than an organized closet. It can completely impact day-to-day life, and lately it has been evident around here as our schedules and home have been a bit out of control. So much so that we are all feeling the negative results of it. I am sure that time management is a far more personal type of organization than most things; what works well for one person may fail for someone else. Over the years I have recognized that when we have a family "hot spot" holding a cleaning checklist, calendar and schedule, we are far more in-sync than when we have nothing at all (which has been our life for the past six months). So obviously, we went back to that system this week, and it has been amazing the difference it has made with the kids already. And myself. No more need to repeat myself 5,268 times when the kids ask what chores need to be done or what we have going on each evening. But this entire challenge ran much deeper than just popping up a calendar and schedule on our memo board. My days are an entirely different challenge. I love to work and have always been a busy body, and I haven't found that working from home causes me to want to lounge in front of the television all day. In fact, it is typically the opposite. I don't know how to stop when I get going on something. And I don't know how to look past a messy house in order to sit down and focus on my work. It always seems that when my work flourishes, my home suffers. And when my home is rockin', I am behind on my work. Although I do blog, I also run an online shop, contribute to other websites, and ultimately have long term goals for my business that I need to focus on. I don't plan to rely on a blogging/Etsy shop income long term, so it is important to remain focused on my future business goals as well. On top of it all, I always feel like I am ten steps behind and that I don't have the time to focus on items that matter most to me. But the funny thing is, I have 16 hours in a day! 16 hours you guys! Do you know how much someone can do in 16 hours? It is amazing that not having a clear plan or focus each day allows those 16 hours to fly by, leaving me to wonder where the day went. And why I didn't go for my nightly run. Or why we don't have enough time for more fun family outings. I think it is safe to say I have been struggling, and I was so excited to focus on taking back my days this week. It was all I could think about and I did a lot of idea jotting and analysis of how we could/should be spending our time. I started out spilling so many thoughts on multiple pages in a notebook, I thought I would create a few printables to compile my ideas and to share with any of you looking to make changes to time management as well. It may seem like a lot of work, or silly to some, but I have to say that in just a couple days I began to notice some difference. At the same time, I know that consistency while also being flexible will ultimately be the key to long term success. You can download your own Time Management Bundle HERE! My first step in the process was to list out all of my day-to-day tasks. Everything from taking a shower to checking emails to chores and exercise. I listed the items I do without any thought each day, as well as the items I want to make sure I have time for, things like reading and running. This is not intended to be a "to-do" list. This is just to recognize reoccurring items that build your day from sun up to sun down. One of my biggest goals in this process is to get my tush in bed by 11:00 PM each weeknight. I am a night owl and super slooooow in the morning, so this is never easy. But the days I am up earlier tend to be the days I am also the most productive. Being that I never get 8 hours of sleep makes this by far the most important goal of this entire process. Starting at 7:00 AM through 11:00 PM, I began filling in the tasks I listed in Step 1. I placed tasks in the time slots that made the most sense, and made quite a few adjustments to how my day was previously laid out. I have done this activity in the past, and it is always super enlightening! This is when I realize how hard it really should be to fill those 16 hours per day. I am able to put all of my desired daily tasks into time slots and still have a few spaces free while also getting a full 8 hours of sleep!? Knowing that makes me wonder how many hours I spend lost on my computer with little direction; checking email one minute, working on a printable the next. Oh! Hello Instagram feed! What? You blogged about that? Must read it! I forgot, I have to search Pinterest for dramatic bathroom colors. Hey! I wonder if that top comes in my size! Please tell me it is not just me who falls down the Internet trap so easily. 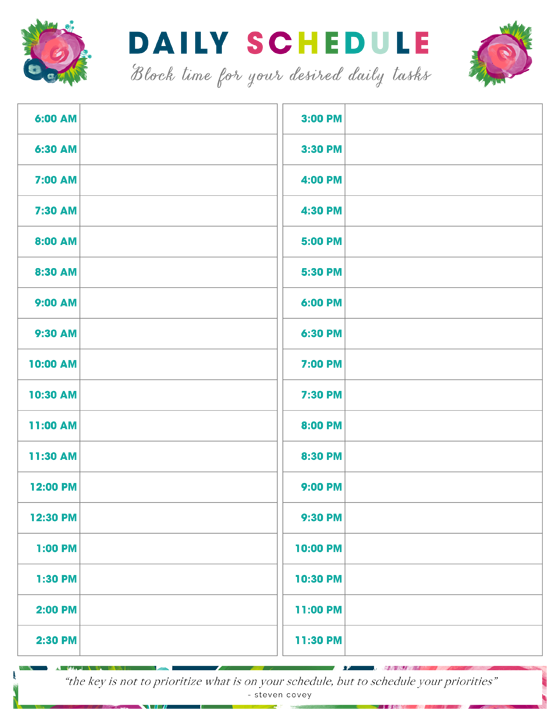 By completing the daily schedule, it allowed me to fill in time to work on emails each day. When my time is up, my email will be closed until the next day. No more hitting refresh in the middle of writing a post, and no more not even checking in on emails because I never got to them. I blocked specific times of the day for my daily reoccurring tasks, and other times I just blocked with a generic "work" title (more on that in a moment). Generally, my biggest problem is transitioning from one task to the next; knowing that I have a cut-off time and that I need to stick to my schedule. To enforce the blocked times, I set a timer on my oven. This will require me to get up and out of my seat to shut it off after each given task. I always joke with Bryan that I am glued to my chair by lunch time (gross right? ), so hopefully the action of getting up to shut off a timer will also keep my body moving periodically throughout the day. Now, of course no two days are the same. There are days with sporting events and doctor appointments and travel... The goal is just to fill out a typical day. And if baseball games are typical, maybe do a second one for those types of days. My biggest tip while doing this is to leave spots for FREE time! Do not book yourself solid throughout the day. I made sure to give myself a lunch hour, free time before dinner and more free time right before bed. Knowing I have breaks in there is already refreshing and will drive me to be more focused on specific tasks during the scheduled periods of time. Also, try to over estimate your time whenever possible. This will ensure that you can have even more free time or feel ahead of the game vs. always feeling behind. I did two schedules; one for myself and one for the boys. I popped mine into my planner and I placed the one for the boy's up on the memo board for summer. School just got out this week, so we will have a lot of adjusting to do and the kids needed ideas for filling their days while I still try and balance working, house chores and quality family time. As I mentioned in Step 2, while I was filling in my daily schedule there were times I blocked specific reoccurring work tasks, like working on emails, and other times I just blocked generic work shifts. This is where the time to work on my website, my shop, writing posts, evolving/growing, contributing work, etc... comes in to play. Instead of going into the week and basically winging things, I decided to fill out a general schedule for each day. For example, our kiddos LOVE Sunday brunch so I wrote that in as an important reoccurring Sunday task. We have to grocery shop each week, so I now scheduled in a specific day to go. Friday nights should be FUN nights, so I blocked those and told myself no more working or house chores on Friday nights. When it comes to work, I picked days to write posts, and I selected days to focus on my other work tasks. Hopefully, by dividing out some of my daily tasks throughout the week vs. working on each one as I have time, I can become more efficient with each one. Each one will now receive the attention it deserves. I also plan to schedule meetings, phone calls, appointments, etc... around those blocked times. One of the tips I read while looking into the topic of time management, was to take a few minutes at the beginning of each day to make a plan of attack. So, I included a printable for that within the kit. I typically rely on my daily planner for this, but now I have it built in to my morning routine to look at my planner, compare it to my daily schedule, and mash them together. It also allows me to take a few minutes to list a couple specific goals for the day. Now that I have a teenager, I get asked on a daily basis, "Mom, what do we have going on tonight? How about this weekend?" OK, I get asked the same questions by my husband each day as well. It was time to get a visible calendar back in a central location. 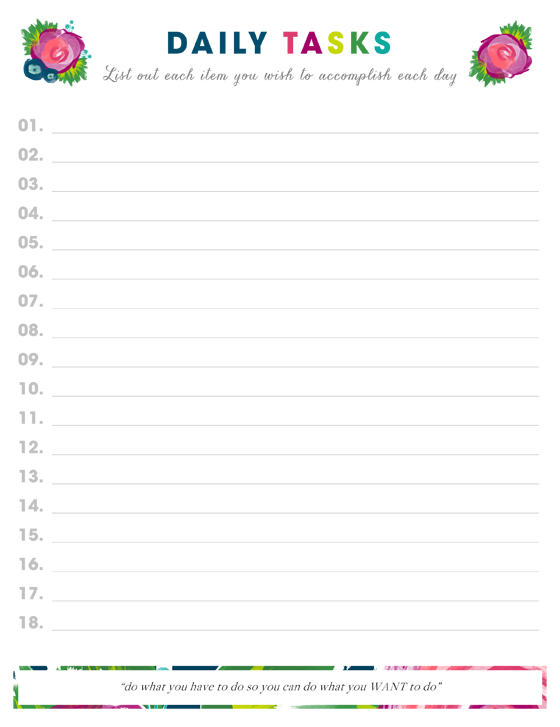 I transferred all family related items to the calendar from my planner, so the entire crew can see what each day holds. My kids do so much better when they know what is coming ahead of time and have a set routine, so having their chores, schedules and calendars out in the open really prevents meltdowns. There are no more surprises when I have to tell them, "No" to going to a friend's home if their chores are not done or if we already had something else on the calendar. Speaking of chores... I have really slacked at holding the boys accountable to doing their daily chores. I felt this sense of mom-guilt about the destruction of our home and the impact it was also having on the boys. They still helped, but there were so many times I just found myself doing something because it was easier to keep them out of the construction mess or because the lack of main living spaces caused a trickle effect to the rest of the home. But now that things are finally back to a functional and livable state, they can pick back up where they left off. We sat down and reassigned daily house chores to each member of the family. This was a family discussion and they all felt satisfied with the chores they ended up with. My hubby laughed when he saw his list was shorter than the rest of ours (he said, "Great, now the world will think I don't do anything around the house! "), but seeing that he does most of the cooking and building, we do the rest. Team work! So cheers to taking back our days! I know it won't make everything roses and that we will still have to be flexible, but hopefully there will be a lot more definition and awareness of how our time is spent. Mostly mine, because as much as I love working from home, it is so easy to get lost in the hours of the day. And to balance the difference between housework and work work. I hope that I can now stay focused on both my long and short term goals while also achieving a better sense of work/life balance. Now! Who wants to win a $50 Gift Certificate to HomeGoods!? I popped in there the other day to pick up the gift, and couldn't walk out empty handed. 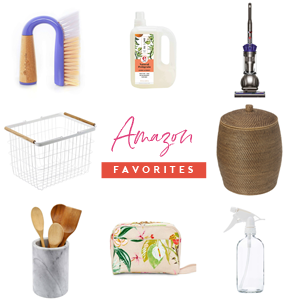 I managed to cross a few items off of our home wish list. HomeGoods is one of the first places I turn to for storage solutions when working on organizing projects, so they seemed like the perfect fit for this week's prize. Using random.org, one link party participant will be selected to win the gift card at the end of this week's challenge (no need to participate each week to win)! Time to share your Week 1 stories and projects with me! I was so excited to hear how many of you were planning on participating in the weekly challenges with me! I am even more excited to see what y'all have been up to this week! UPDATE! Congratulations to this week's winner! 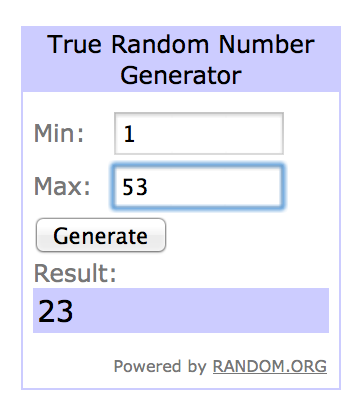 #23 has been selected by Random.org as the winning participant of Week One! Keep an eye on your email, I will be contacting soon to coordinate your HomeGoods gift card winnings! 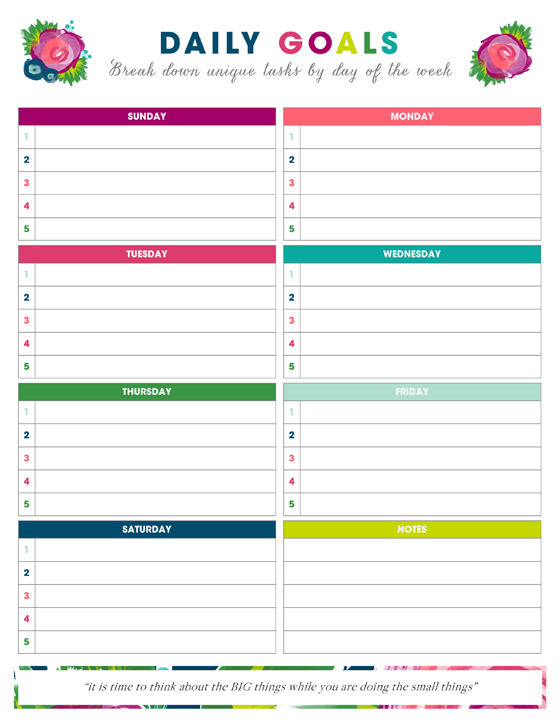 I think time management is one of the hardest things to "organize", so bravo for finding a solution and for sharing it with us--and for making it pretty! Hopefully, it will now be that much easier for you to complete your other 3 goals this month :) Thanks again for motivating me to make changes that will help my life run a little more smoothly. Can i kindly ask where you get your actual binder for your lovely organiser from? I live in the United Kingdom and have struggled for so long to find one that is an empty shell and i can add my own pages too. Hi Sophie! 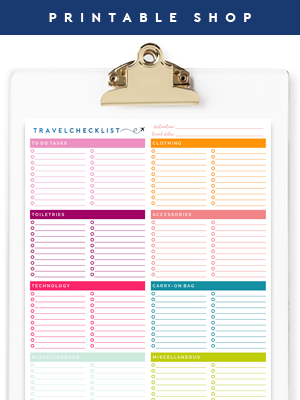 I use the Kikki-K system which I pair with my printables: http://www.kikki-k.com. You have no idea how much it needed this post right now. Everything you said hit home. 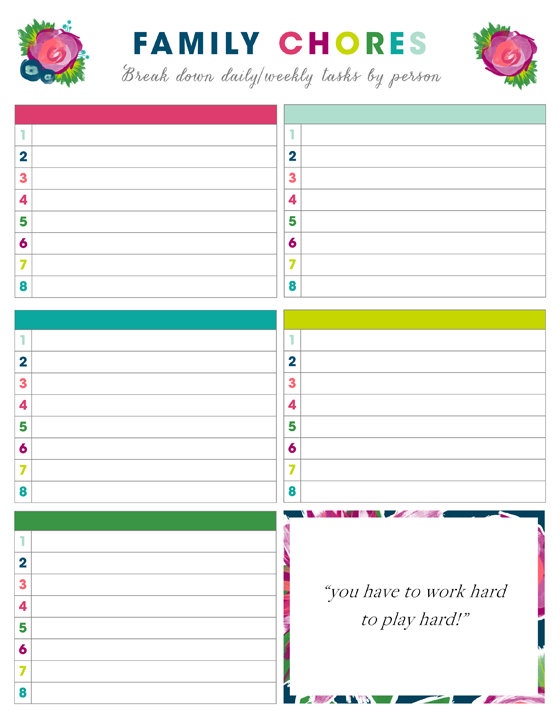 With kids home on summer break, and my own fledgling home based business, these ideas/printables are just the thing for taking my life and home back. Thank you for your awesome, inspiring posts that get my booty going! PERFECT, thank you!! This very thing--organizing our time, making a schedule and daily to-do lists--has been on my project list for some time. This post was the perfect nudge I need to just do it! 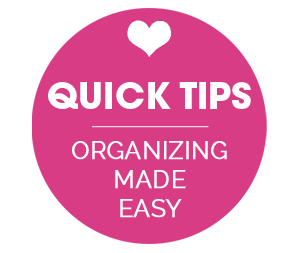 I appreciate that you're sharing your organizational/time struggles instead of just sharing all that amazing beauty! ;-) It makes you real, and helps us not feel like failures when things inevitably go the same for us. :-) Life is life; thanks for giving us tips to help us do it better... and more beautifully!! The printables are so pretty. Did you make the art? I did, thank you Antonella! Thank you for such lovely free printables! I'm going to start using them like right now. Thank you so much for the printables. They are really going to help make the summer much more productive and enjoyable for my family. Now, if I could only get someone else to help with the chores! Great idea! You never fail to bring us the best printables! Hi Jen- off topic question but what would you say your decorating style is? I love your style, and am automatically drawn to your designs! As I grow to love decorating more and more, I have a hard time nailing down my style. Perhaps defining it with a name is not even necessary. I feel like my style is the Jen Jones' style! Just wondering what you would call your style so as I research ideas for my house, I can narrow down my searches! I love mixing beachy colors (greens, blues, greys and whites) with small hits of pink. I enjoy mixing items that are old and new, but I don't typically go for distressed or shabby chic pieces. I love clean and crisp lines mixed with a variety of wood tones and finishes. And hits of bold floral patterns always make me smile. I know that doesn't give you key words to search, but those are all elements I try to incorporate into each space. Thanks for the great information! I love organizing but I can't get my time management down. I feel you on the kids activities, volunteering, and I also work outside the home. 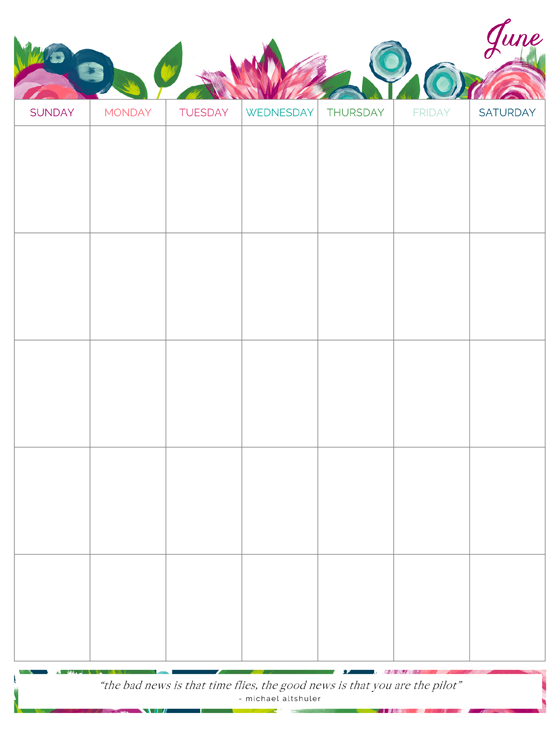 I'm hoping I can use your printables to get myself on track! Although it has evolved over the years a bit, but when planning I typically do a theme each night of the week. For example, a night for sandwiches, for Mexican, for Italian, for grilling, for pizza, etc... Then I sit down and plan those meals around our weekly schedule. IT'S NOT JUST YOU!!! Omg Jen, each time I fall into that trap all I want to do is bang my head against the wall and say: "Not AGAIN! Not AGAIN!" If I don't keep my social media closed while I work on posts or photos, my whole day gets messed up.. My phone needs to stay in another room so I don't get distracted by notifications and if someone calls, I check but doesn't answer unless I am absolutely sure it's something that can't wait. This is going to be such a fun challenge! I wish I had had time to check my mail subscription on June 2-end so I would have been more prepared for this challenge cuz I badly need it!! Things have seriously gotten out of control ever since I had to spend my days outside on my home, taking a course & working after that.. I may not have time to blog about the challenge but I take it and I'll make the best out of it - even if I don't get a chance to write about it! Thanks for the motivation Jen! Thank you for the printables! As always they are gorgeous!!! Im rather shocked that you didnt have a specific day for grocery shopping? How did you do it?! 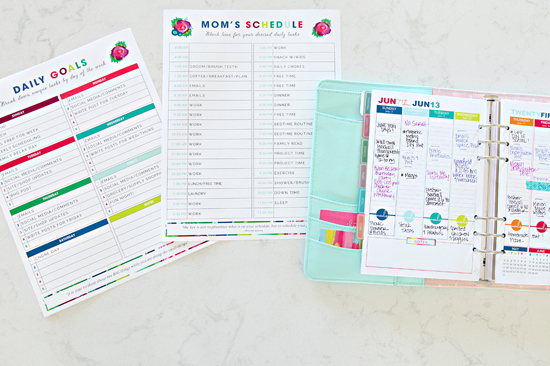 I love how gorgeous your printables are!! Thanks for sharing them with us. There's currently a crisis with our system, my wife likes the big color coordinated calendar I put on the fridge each month and I hate it and prefer my planner. We'll ser how it all works out when we move in 79 days (but whos counting)! Hi, thanks for a good read and lovely printables. Unfortunately, I have been trying to download the time management kit for the greater part of two days now (my internet connection is not the best!) but it fails every time. I even tried 3 different browsers. The download stops somewhere before halfway and Adobe reports the file to be 'damaged and could not be repaired'. Is it just happening to me? 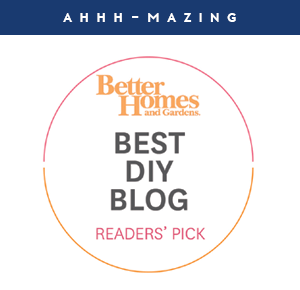 While I'm here (commenting for the first time), let me thank you for a lovely blog and congratulate you on a wonderful job in your kitchen and living room. I am in awe of your DIY skills! Oh thank goodness, I finally managed to download it! I honestly tried more than 10 times in the space of 2 or 3 days, I think! Can't wait to put them to good use! 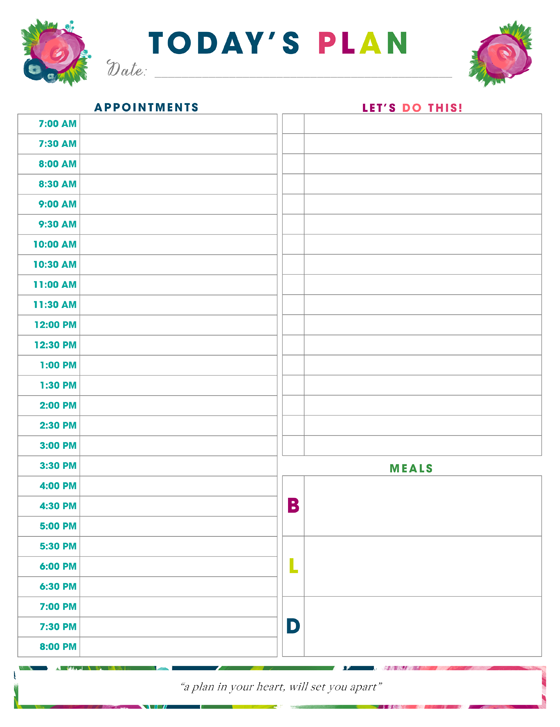 If you continue to have any trouble, feel free to email iheartorganizing@gmail.com with the subject line: TIME MANAGEMENT PRINTABLES and I will do my best to email you the PDF file as quickly as possible. Hello!!! 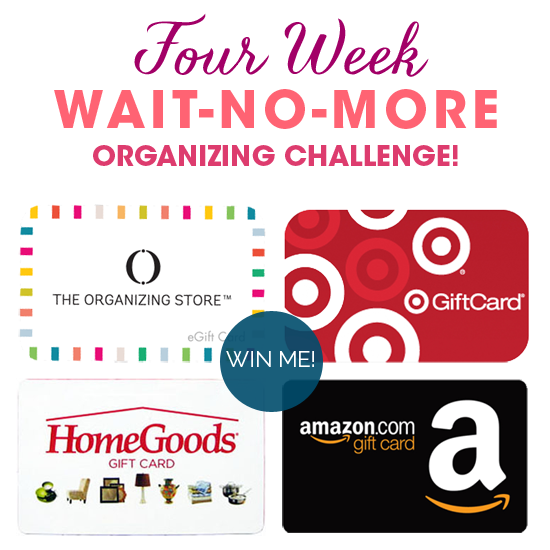 I'm interested in following along with this challenge and entering for the gift card! But currently don't have my own blog (something to aspire to in the future hopefully!). What are the other ways I can post or enter? Thanks!! So excited to keep following along! Hi Courtney! You can Instagram your After photo and share the link to the Instagram photo or upload the "After" photo to a photo-sharing website (such as photobucket) and share that link as well. In those situations, you will just have to be sure that your profile is not private so that I am able to view your photo, username and caption. Hope it works out! Thanks so much for the printables. So very kind of you to share them for free. I plan to laminate them or put them in plastic sleeves to use a dry erase marker on them so they can be reused each time. Where or WHERE did you get those adorable gold bow magnets?! I MUST have them!! And as always, thank you so much for the free printables! These are fantastic! Jen- You're talents never cease to amaze me. The art on these printables is gorgeous! Thank you for sharing them. Thanks also for sharing that you sometimes feel overwhelmed and let things slide. I just said to my family last night..."we have to get back to regular chores." Nice to know I am not alone! Thank you very much for this post and printables. I was struggling to get through each day, feeling exhausted without accomplishing anything so really was on time. My question is, how do your boys know which chores to do when? Do you have a day by day or weekly schedule for their chores? Most of the chores are done daily during our "chore time", but they have had many of the same chores for the past year or so, so they know the few items that they only have to do once/week. You could easily just add the frequency after each chore to help family members identify when getting started. :) xoxo! You are so right about time management being the first thing to get right. It's so hard to stay on top of everything without a plan but like you, I start with the best intentions and then after a while, life takes over! Time to take back control! I love the gorgeous printables. Thanks so much for hosting. I really felt like I had my time management under control (working mom outside the home seems to lead to pretty regimented days) but I keep reading this post over and over and it really hits home on some of the areas I've lacked on. I tend to do 90% of my at-home productivity after my toddler goes to bed, and every night find myself disappointed by how much I didn't accomplish. Thanks for sharing! 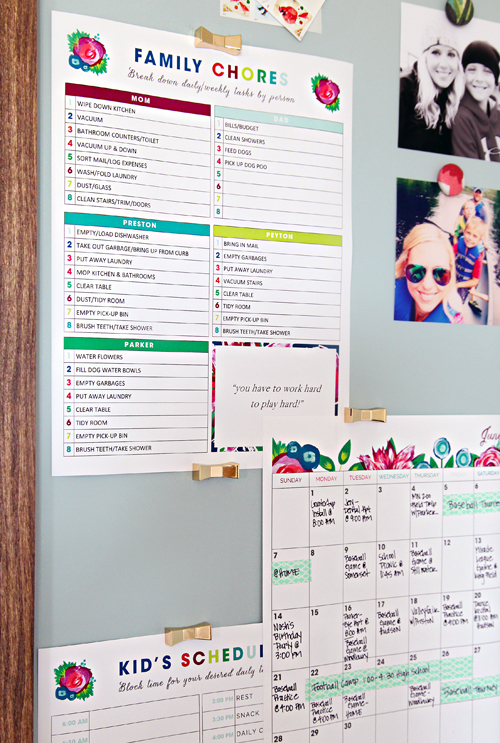 Hi, I love the printables and the idea of making the most of my days. But, I was wondering how to plan my time management planning? LOL! What I mean is, do you print these each day and fill them in; or mass print a stack of them at once?Would I fill this out the night before or the day of? How to plan for little things that pop up? And lastly, if I dont meet that goal for the day, do I move it to the next day? I am desperately wanting to nail down time management but I struggle with exactly HOW to implement a system. Does that make sense? Maybe a post on how to implement would be great! I honestly feel lost. 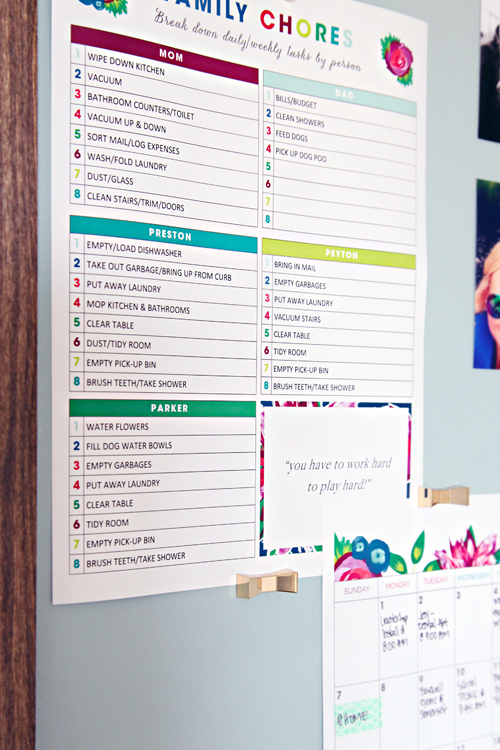 Majority of the printables were filled out one time and pinned up on our memo board or popped inside my planner as a general reminder/guidelines for goals. 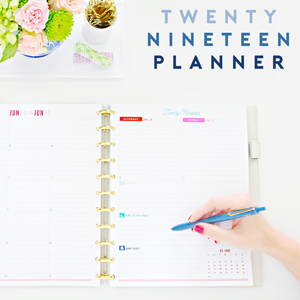 I like to take a few minutes each Sunday and compare my planner to our meal plans and my weekly tasks, and then each morning I come up with a daily plan according to what needs to get done and what our day looks like. I typically just write things down in my planner, but if I have a lot going on, I will print out the daily planning page for a little extra guidance. I try to limit my goals to 3-5 per day, and yes, they carry over and are re-prioritized the following day if I don't get to them all. I think it is important to stay aware of how much you are trying to take on in a given day, and be OK saying "no" to some things if you are constantly trying to play catchup. I prefer to design in Microsoft Publisher.